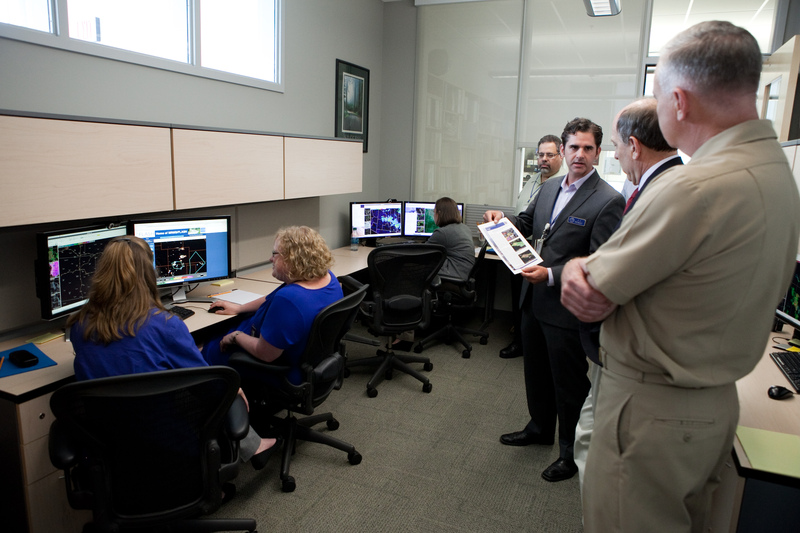 On Wednesday, July 16, 2014, HWT-Hydro received a visit from NOAA Deputy Under Secretary Vice Adm. Michael S. Devany and National Weather Service Director Dr. Louis W. Uccellini. They were visiting Norman to see how research-to-operations (R2O) activities are conducted within the various NOAA units housed in the National Weather Center. Both officials discussed the ongoing efforts to align research activities at NSSL with the operational needs of the NWS. Dr. Uccellini described methods of easing the eventual R2O transition of the FLASH suite of forecast tools with the experiment’s principal investigator, Dr. JJ Gourley. Dr. Gourley also took the opportunity to explain how the various components of the FLASH product suite work in unison to give forecasters a view of heavy precipitation and flooding issues. Vice Adm. Devany and Dr. Uccellini visited during the middle of an experimental forecasting shift, where week 2 HWT-Hydro participants were monitoring potential flash flooding impacts in the High Plains and the Intermountain West. Week 2 participants are Britt Westergard (NWS Albany NY), Laura Belanger (NWS Peachtree City GA), Amanda Schroeder (NWS Fort Worth TX), and Jeff Waldstreicher (NWS Eastern Region). Experimental activities have also attracted the attention of local media in central Oklahoma. Oklahoma City’s Fox affiliate, KOKH, aired a story about the experiment on Thursday, July 10. The KOKH story is available here: http://www.okcfox.com/story/25990371/forecasters-test-technology-to-better-predict-flash-floods.